It is hard to spot a market bubble in the making. As they inflate, market participants often rationalise their investment decisions as to why they are paying higher prices. It’s only after they burst that bubbles become clear. The most recent bubble bursting has been Bitcoin. Now we would contend that there is a ‘quality’ bubble brewing. Over the last decade, there has been excellent academic research on quality investing. One research paper even suggests that Warren Buffet’s investment style is just a leveraged strategy on quality stocks. Why wouldn’t you want to replicate the investment style of the world’s greatest investor backed by a mountain of academic research? To be clear, we believe investing in quality stocks can generate reasonable returns. However, price also plays an important role in generating future total returns. When price is ignored, the foundations for low future returns are set. Falling in love with quality companies is not new. In the early 1970s, it felt right to buy and hold the best 50 companies (Nifty Fifty) in the US market. Yet, like all good booms, valuations hit extreme levels and it eventually ended badly. In today’s environment, there seems to be much uncertainty … potentially rising interest rates, lower economic growth, volatile commodity prices, and increasing Government intervention. It might feel good buying quality companies that can grow earnings in the face of these uncertainties. And it’s very easy to justify buying them when their returns on capital are high and long-term prospects seem strong. Indeed, quality companies have delivered excellent long-term earnings growth. 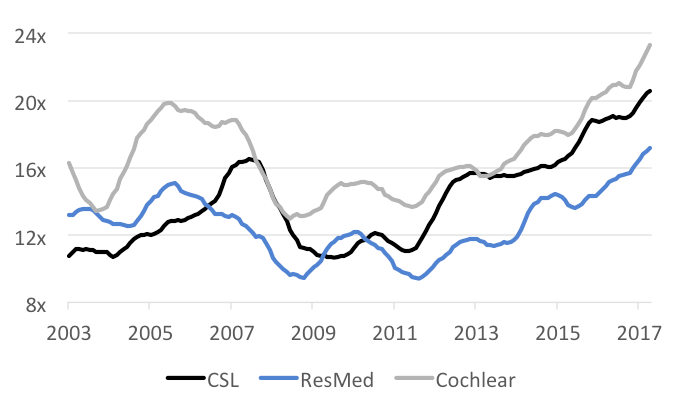 The following chart highlights forecast EBITDA growth of three stocks that many consider royalty in Australia – CSL, ResMed and Cochlear. Very few companies have achieved these phenomenal growth rates over a 15-year period. Prior to 2009, when these companies were smaller their historic and forecast earnings growth were exceptional. 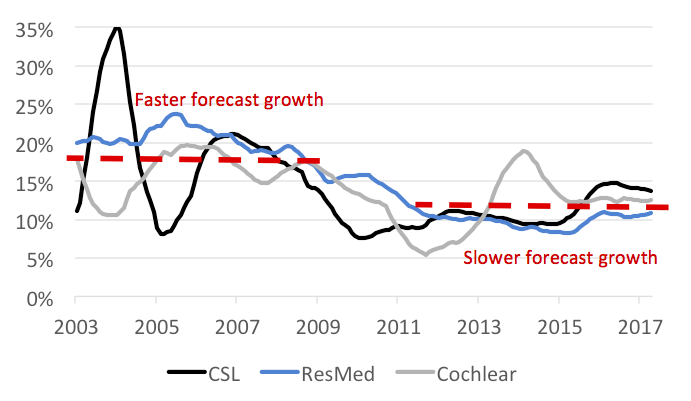 However, post-2009 their forecast earnings growth, although healthy, has been more subdued. The following chart highlights their valuations (as represented by forecast EV/EBITDA multiples) over the same time frame. High valuations are expected for fast-growing companies. However, the above charts highlight something very odd for these quality stocks. Over the last year, their valuations have skyrocketed. Their multiples are now at 15-year highs while their forecast earnings growth has remained relatively constant around 13% per annum. In contrast, 2006/2007 was the last period where extreme multiples were observed but earnings growth was significantly stronger. These quality companies are exhibiting peak multiples despite lower growth expectations. History shows that extreme multiples do not last forever. While the earnings growth may be sustainable, poor future returns are the likely outcome when peak multiples mean revert. High-quality companies do not necessarily make high-quality investments. Interesting analysis. A number of bluechip healthcare stocks do seem to attract unqualified support from the pundits and investors. Yet it is curious to note that prior to 2000, the performance of Australian healthcare stocks overall wasn't particularly impressive. Interesting work. Are there anymore stocks with high multiples and lower growth estimates?